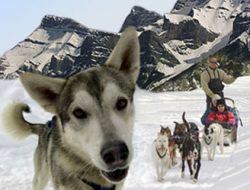 Take advantage of the only dog sled tour company permitted to operate in Banff National Park. Departing from Lake Louise, just below the Chateau Lake Louise and Deer Lodge, you don't have far to go! The most popular dog sled tour, the Great Divide Tour, takes you over the Continental Divide into Yoho National Park. There are plenty of opportunities for photos and you have the chance to drive the sled yourself under guided supervision. Make sure you arrive early so that you can get to know the dogs! Dress in your ski gear including a hat and neck warmer as you may need to cover your face. Warm boots are also recommended.